A decade later, the couple honeymooned in Spain’s Basque country, making the obligatory visits to the touted temples of molecular cuisine. (“Left us cold,” recalls Denton.) They ate grilled fish overlooking the Bay of Biscay in Getteria and snagged a reservation at Extebarri in Axpe (the world’s most celebrated grill restaurant—to be the subject of a future blog). And that very night, somewhere between the first bite of smoked caviar and the last slurp of single perfectly grilled prawn (“a hallucinogenic experience” in Denton’s words), they decided to open OX. “Once we committed, everything fell in place,” Denton says. The couple found a cavernous brick storefront built in the 1890s in Portland’s Boise-Eliot district. (Over the years, the building has served as a creamery, car dealership, and brothel.) 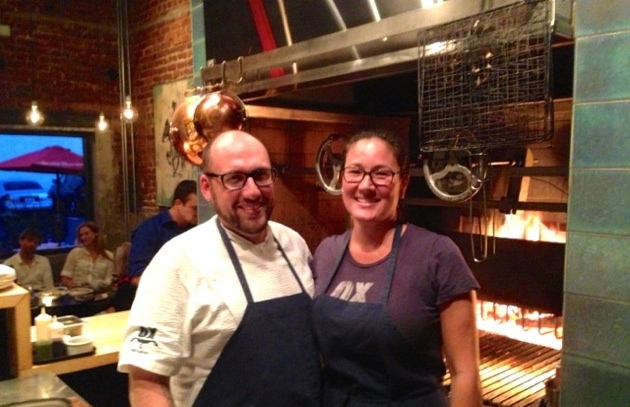 Along the way they met Ben Eisendrath of Grillworks, manufacturer of a super-premium Argentinean-style wood-burning grill that now serves as the focal point of the dining room. The restaurant opened on April 24, 2012. Intrigued by the challenge, Eisendrath designed a new grill for them, the “Denton” Dual Architectural Asador, 48-inches of gleaming high-tech stainless steel with split grates that raise and lower with the spin of flywheels and a vertical firebox in the back. The system is stunning in its simplicity: You burn the logs to embers in the firebox. As the glowing coals fall to the bottom, you rake the precise amount you need under the food on the grill. The V-shaped grates channel the fat into drip pans loaded with garlic, herbs, and sliced lemons. The drippings get brushed back over the meat. In homage to Gabi’s Ecuadorian heritage, the husband-wife chefs loaded the menu with South American classics, like pisco sours (made with smoked lemon), ceviche samplers, Uruguayan grass-fed skirt steak, and a stunning grilled lamb heart herb salad—a twist on Peruvian antichucos. In keeping with Greg’s New England roots, they serve chowder, only it’s electrified with jalapenos and an astonishing smoked marrowbone. Halibut comes in bible-thick steaks on the bone, while mammoth artichokes are roasted directly on the embers. And because this is Portland, you don’t have to ask if the grilled beef short rib, maple-brined pork loin chop, or house-made morcilla (blood sausage) on the Asado Argentino platter are humanely raised or locavore. Of course they are. “Grilling is such a simple process, but the flavors are so complex,” says Denton (recognizable by the octopus tentacle tattoo snaking up his arm). “A wood fire just makes food taste better.” Amen. 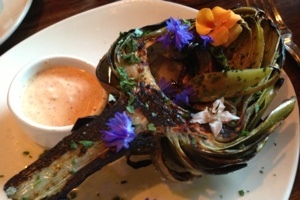 TRY OX RESTAURANT’S WOOD GRILLED ARTICHOKES WITH PIMENT D’ESPELETTE AIOLI! The fresher and greener the wood, the harder it is to burn. Use wood that has been seasoned (dried) properly for at least six months. Harder woods, such as maple and oak, burn the longest and hottest. Don’t start your fire with lighter fluid—it will give your food a chemical taste. Instead, use charcoal lit with paper in a chimney starter. Get the coals red hot, then dump them into your grill. Add the wood and light it off the charcoal. Always have a backup fire. Build the first fire large enough so that when you spread out the embers, you can set a quarter of them of to the side to start a second fire. This fire allows you to burn more embers as you need them. There’s nothing worse than realizing you need more embers to finish cooking your food and having to start a second fire from scratch. To add an additional layer of smoke flavor, toss additional dried fruit wood chips or chunks on the embers the last two to three minutes of cooking. Don’t be afraid to cook foods directly on the coals. Spread them out evenly (use a grill hoe) once the flames have died down, then lay a grill grate on the coals and cook your food right on it. Or right on the coals. This works well for foods that don’t need to cook too long, such as rare fish and steak or vegetables that have been par-boiled (like artichokes).